We recently travelled by road from home in Murray Bridge, South Australia (near Adelaide) to visit family in Sydney. The road trip took two days of many hours of travelling because it is a journey of over 1300km. We didn’t have many opportunities to stop and do some birding, so I had to be content with the birds seen while travelling along at highway speeds – usually 95 – 105kph. That’s not conducive to good birding practices, nor does it allow bird photography. 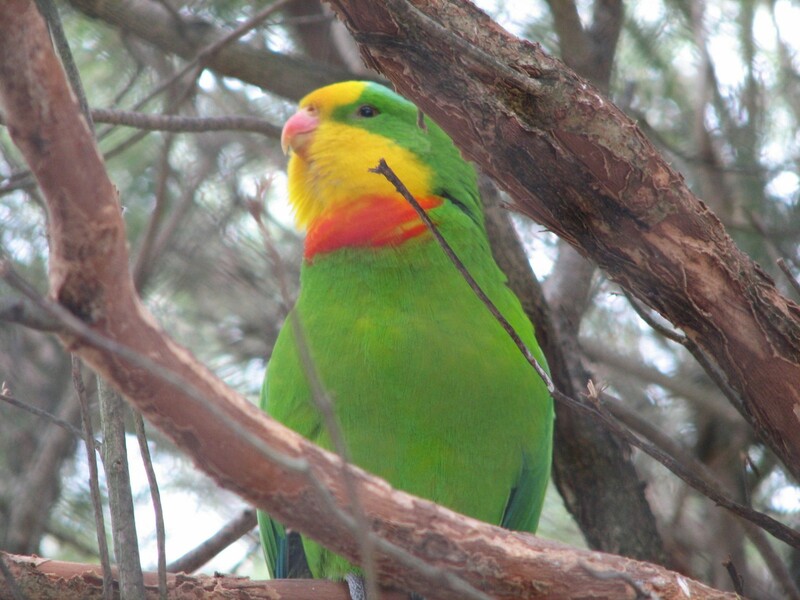 While travelling between Narrandera and Wagga Wagga in central west NSW I saw a solitary Superb Parrot fly across the road in front of the car. This is only the second time I’ve seen this parrot outside of an aviary. This particular area is one of the regions where this species is relatively common. It is a spectacular bird, as shown in the photo above. I cheated with this photo; it was taken of a captive bird in one of the aviaries in the Adelaide Zoo. It’s not a great photo because it was taken through the wire netting of the aviary. One day I’ll see one in the wild, one which poses perfectly for my camera. It’s always such a thrill to see one isn’t it? We get them from time to time in the Central West of NSW where I live. Indeed – they are amazingly beautiful birds. Wish we had them in our garden.